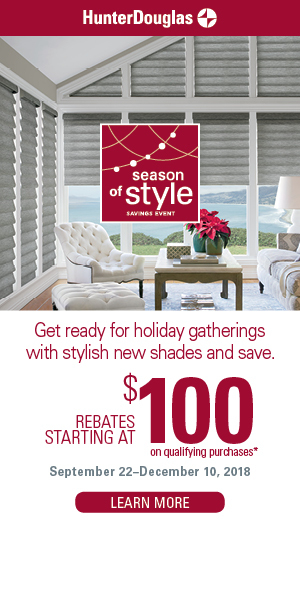 For the past 30 years my wife and I have been living in Chicagoland in a large home. This home provided a great foundation to raise our children, but they are now all grown up and moved out. In addition to this home, we have another home in Naples Florida where we spend more than half the year at to get away from the colder months in Chicagoland. It was clearly time for us Baby Boomers to Downsize. We moved into our new home that is about half the size of our prior home. In our former home we had custom designed closets from Closet Works that maximized the utilization of space. 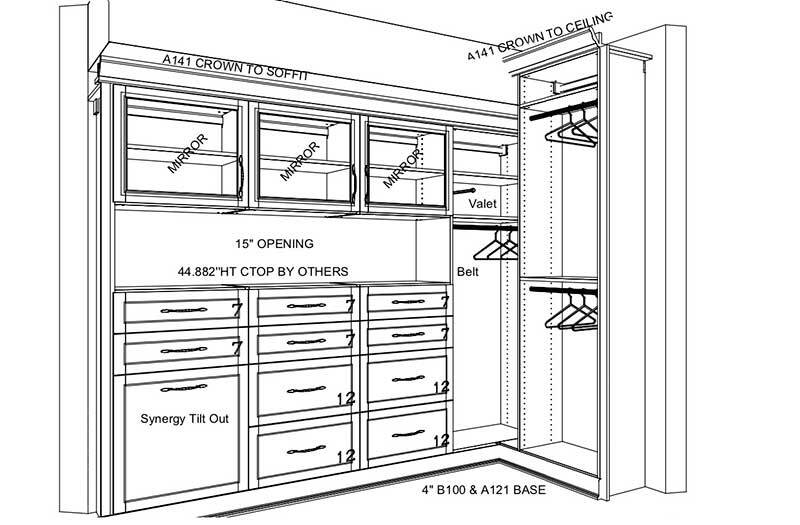 Custom Closets were a great luxury we became accustomed to using every day to both start and end our day. However, with space in our new home being smaller, custom closets were no longer a Luxury but now a NECESSITY. The existing master closet in the new smaller home had to go, only one rod level of hanging, no drawers no cabinet storage no hamper, a real waste of walk in closet space. As done in the past, I simply called Closet Works and their experienced designer, Lynn Casanova, came out to discuss my needs and goals within my closet space. She showed me the wide range of 34 standard Thermally Fused Laminate (TFL) colors offered. The material they use is ¾" thick, Furniture grade, durable with a wide range of colors that fit beautifully into my home. I decided to use the White Chocolate color for it was light, current and a bit of texture. 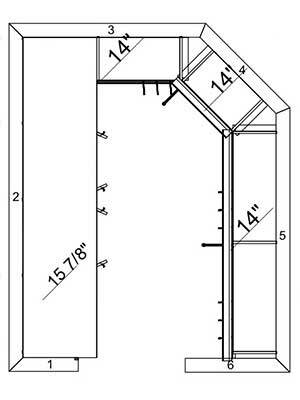 Lynn carefully measured the space and then sent me a proposal that contained plan and elevation views of the proposed closet. The drawings were computer drawn and very easy to visualize my new organized space. The newly designed space included a clothes hamper system, 10 wooden drawers and 3 doors with mirror inserts. Both the drawers and doors of the closet have automatic soft close feature which is a fantastic standard option. Closet Works discussed the importance of doing a proper tear out of the old closet system and repair / paint of the walls within the space. They offer this service, but I completed this work myself since I had the time. The closet was easy to paint since it was now empty. I used a light color that complemented the White Chocolate closet system. Their installers were great. They were very professional and kept the working area very clean. They brought in the wood components that were all precut at Closet Works 60,000 sq. ft. factory in Elmhurst, IL and assembled it in the closet. The installation was completed in just one day and when finished I simply opened up the closet and began putting my clothes away. I now have less stress and more than enough room for all of my clothes, pictures and collectables. I have successfully downsized and enjoyed The Closet Works experience to "Organize my Life". After all, everything is easier when you're organized! 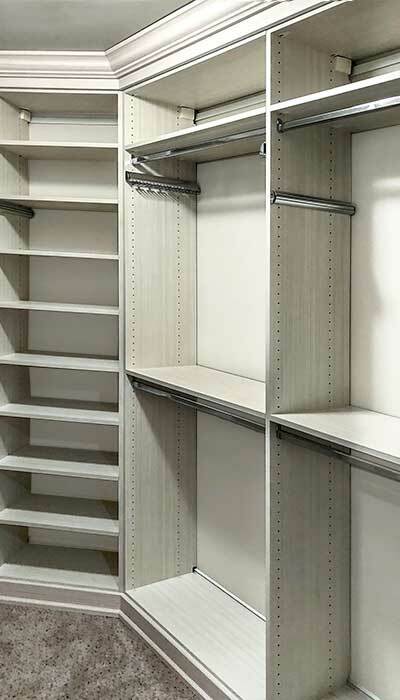 In custom closet design, there are three rules that should be followed in order to maximize both accessibility of closet items, as well as storage capacity of the closet itself. If the following rules are properly adhered to, the closet will not only be fully functional with maximum storage space, but will be aesthetically pleasing as well. Double hang or long hang should go into corners. Shelves, drawers, and half and half come out of corners. Shelving should never be positioned all the way in a corner. Out of the corner: Always use shelving, drawers or half and half when designing out of the corner. In this case we have a triple hutch with drawers and cabinets (cabinets are basically shelves with doors covering them) designed. All shelving widths should be designed to the nearest inch. The odd dimension can be applied in the 26" to 30" width bridge shelf out of the corner. 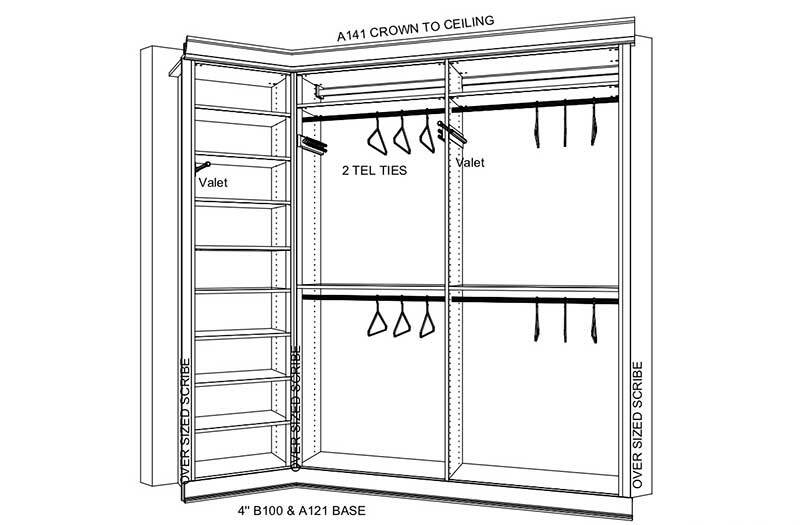 Into the corner: Hanging in the corner should always be utilized when designing a closet. It is always easier to reach for a hanger than access something on a shelf. Also, drawers in a corner aren't suggested because fully extending the drawer box to access the items in the drawers would be very difficult. Note how Frank's closet includes long hang in the corner and double hang across the short wall. Cabinets/drawers are used next to the corner long hang area. The shortest wall in a walk-in closet should always be designed for long hang and double hang systems that go wall to wall. Because most walk-in closets have one wall that is shorter than the rest (and is usually positioned in the back of the closet), this wall should be reserved for wall-to-wall hanging. By following this rule, more shelving and drawer space will be created on the sides of the closet, as opposed to the back wall. This will allow the closet to feel more open and less like a tunnel. The short wall measurement is always the easiest to obtain, and it must be precise. Shelving has purpose. Because of this, shelving should always be designed for speciﬁc items. 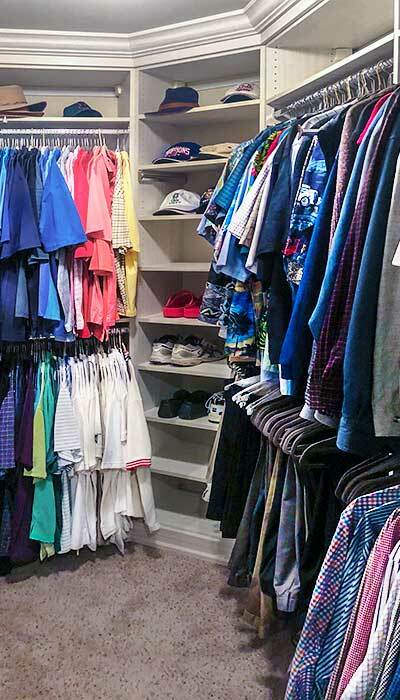 Because the average person's basic closet inventory is the same across the board, this task should be able to be mostly ﬁnished without meeting the person the closet is intended for. Sweaters and shirts are around 12"-15" in width, and drawers and baskets are designed to ﬁt these measurements. Standard drawer widths are 18", 24", and 30". 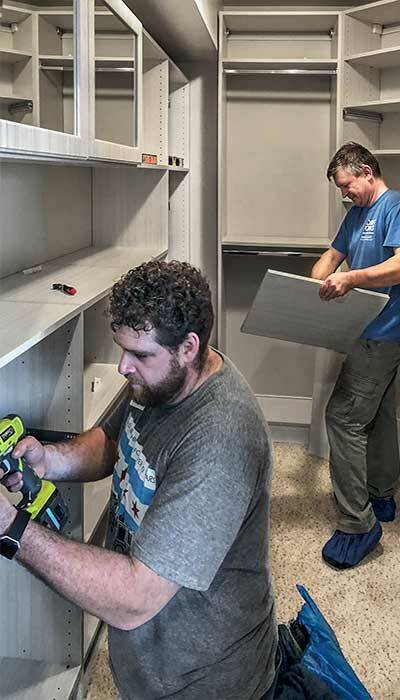 Whether or not the closet you are designing has drawers or baskets, you should always keep shelving measurements to standard widths and avoid fractions of inches, unless it is a hard measurement. By following these measurement guidelines, the shelves will be adjustable and interchangeable throughout the system. This will allow you to easily make adjustments to your closet as your needs change. The wall with the odd angle was used for shelves, ensuring easy access to all items stored in the closet. By following these three simple rules, you can more than double the storage space in your new, downsized home. After all, it won't really matter if your new closet is half the size of the old one if it can be made to hold twice as much! A custom closet makes the transition to a smaller, downsized home easier by increasing the amount of storage available. The large number of closet drawers ensures that both large and small items can be stored in this closet, eliminating some of the need to purge possessions when downsizing to a smaller home. 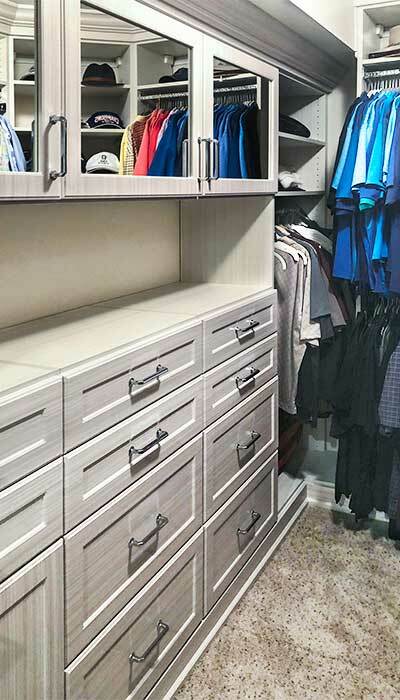 The shelves in the corner of this custom closet have a definite purpose — to organize and store the owner's shoes and hats. Having better organized storage facilities available increases the amount of items a person can successfully keep on hand when downsizing to a smaller home. This walk-in closet is actually quite narrow, but you'd never guess that from the amount of clothing that can be sored in the space. 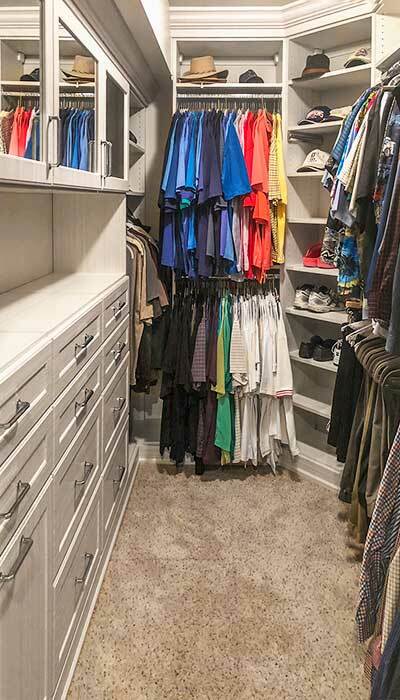 It really holds quite a bit after the installation of a custom closet system designed specifically to hold this owner's clothing organized and maximized the space.